« Should colleges be forced to underwrite student loans? So, what explains student loan defaults? Prompted by ideas being floated to make colleges underwrite their their students’ loans, I’ve been doing some digging. The most headlined explanations of student loan defaults report that over half of for-profit college students and over half of black students default on their loans. The numbers may be true, but they’re more emotionally-charged than they are instructive. So, the left-leaning Brookings Institution drilled deeper on the headlined conclusions to understand what accounts for gaps in student loan defaults. Since race is a categorization variable, not an explanatory variable, Brookings wanted to explain why the black students default rate is about twice that of whites and Hispanics … and 4 times that of Asian-American students. Family background: Parents’ income, home ownership, highest level of education. Student background. Age, gender, SAT scores, financial need (net of family’s financial support). School characteristics: For-profit, public, or private not-for-profit; degree or certificate offered;; level of selectivity. Accumulated loans. The total amount borrowed for undergraduate education. Counter-intuitively, the amount of debt students accumulated is inversely related to default rates. That is, those with more debt are significantly less likely to default. This relationship is driven by 2 forces: (1) students with larger balances also tend to have reached a higher level of academic degree attainment and have commensurately high earnings, and (2) students with smaller balances often dropped out before attaining a certificate or degree, have commensurately low earnings, and rationalize that defaulting on a small debt is no big deal. Parental support – financial and ‘spiritual’ is a critical determinant. “Proxies for parental wealth — including parental homeownership, parental education, and parental financial support are significantly negatively related to likelihood of default. 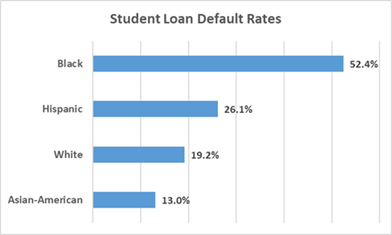 That is, default rates are lower when parents have financial stability, a commitment to education and a willingness to pay for some of the students’ college education. Going-in SAT scores don’t seem to matter, but earned GPAs do. First, even in an era of grade inflation, a high GPA is an indicator of learning and personal discipline that may be leveraged in post-graduation jobs. Default is significantly correlated with debt-to-income ratios. Breaking that apart, the numerator (debt level)depends on (1) how pricey the school is (2) what scholarships and ‘discounts’ the student gets from the school (3) how much parents contribute to school expenses, and (4) student earnings when enrolled. The denominator (income) depends on (1) the school’s ‘brand’ and network (2) the student’s academic performance (3) The value of the learning that the student accumulated and can apply. Said differently, a student who earns stellar grades in, say, computer science has a lower default risk than a student earning marginal grades in philosophy. P.S. I searched for data on default rates by major, but came up dry. My hypothesis: For students completing degrees, their major is probably a significant predictor of default risk. This entry was posted on April 5, 2019 at 6:59 am and is filed under Student Loans. You can follow any responses to this entry through the RSS 2.0 feed. You can leave a response, or trackback from your own site.